Most of us are familiar with the movie Free Willy which tells the tale of a boy who befriends a killer whale and help it escape its aquarium. That movie made killer whales a pop culture icon. Killer whales continue to fascinate, especially since they are too hard to come by in our part of the world. But now, it seems like people in Karachi might just see this majestic beast up close if they are lucky. According to recent reports by nature conservation agency WWF, there has been sightings of a killer whale about 5 kms southwest of Churna Island. The island is located near Karachi. A Pakistani fisherman, Muhammad Muneeb, just recorded the first ever sighting of the Orca in these waters. He was fishing for tuna and stumbled across the killer whale during his expedition. WWF-Pakistan’s Muhammad Moazzam Khan, Technical Advisor (Marine Fisheries), confirmed those sightings as well. He said that this discovery is significant since no killer whales have been found in this area. Killer whales, contrary to their name, belong to the oceanic dolphin family. This makes them the largest member of the dolphin family. It is also widely regarded as one of the world’s most powerful predators. They eat seals, sea lions and other marine mammals, given their carnivorous nature. They are found in almost all parts of the oceans but prefer the cold waters in Antartica and Pacific Ocean. About 25,000 of them are found in Antartica alone. However, the global population of orcas sit at 50,000 only, making them a rare species. Khan stated that recording of orca near Karachi indicates rich marine biodiversity in the area. This is why there’s a need to declare Churna Island as a Marine Protected Area, solely for the reason of protecting such rare animals. Removed all top area and now ProPakistani is looking much better (no more Vivo post). Yeah Propakistani is slowly becoming adpakistani. this is affecting their loyal readers. Exactly. 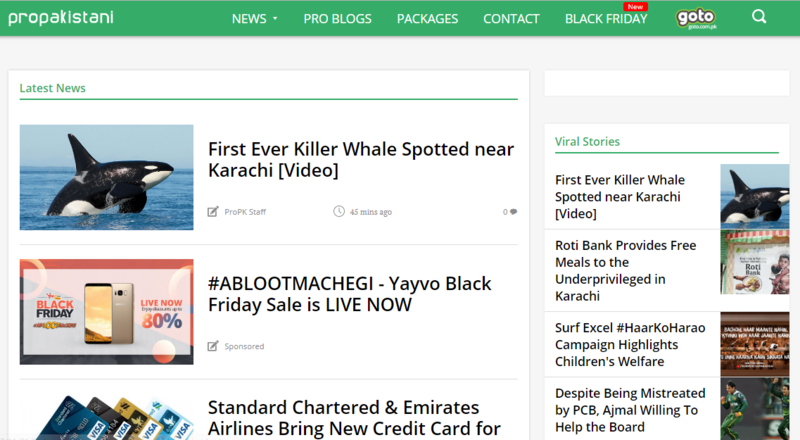 Without ads, it’s not possible to run such blogs but too much ads and sponsored content is making propak boring and usual.